Update 11/5/2008: There’s now an extension for this! 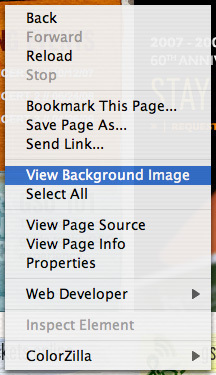 Of all the context menus in Firefox, my second most-clicked item (behind View Page Source) is View Background Image. This stock functionality is one of the many reason I still prefer to use Firefox over Safari, even though Safari’s rendering is notably faster. The problem I have with View Background Image though is that the image I want to view is often associated with a link element. When you right-click on a link though, this menu item is sadly missing. The only other way I’ve managed to find the image if not using the web developer toolbar is by actually finding the reference to it within the style sheet; what can you do? First, pop up Firebug (an amazingly useful developer extension), then click “Inspect” and click on the link whose background you want to find. Once you do, you’ll see the source code of the link the left side of Firebug, and the CSS on the right side. If you mouse over the filename of the image in the CSS panel it’ll give you a little hover preview of the image and it’s dimensions. From there, you can right-click and “Open image in new tab”. This may sound link a long process, but after you do it a few times, it becomes second nature. I just stumbled across your site Jason and saw this post. I have to agree, this is my most clicked menu item in Firefox as well. I reckon I click View Background Image easily 40+ times a day :D.
Dude! You Rock! I can’t wait to play around with this. Thanks, James! Jason – did you get any further with it? Or did the extension do exactly what you wanted?